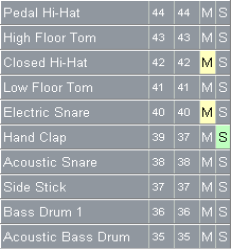 The Note Map pane displays the current drum map. In the Note Map pane each row represents a pitch. The Note In pitch is the recorded pitch. You map the recorded pitch to whatever pitch you want using the Note Out pitch setting. You can also change the name of the mapped note and mute or solo the mapped note.